Hi, I am interested in your 1986 Chevrolet El Camino V8 (stock #1323-NSH) listed on Autotrader for $16,995. I'd like to get more information about this vehicle and confirm its availability. 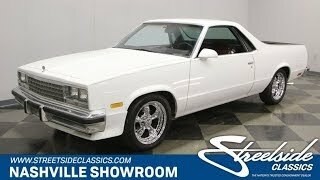 As production was winding down on the last of the El Caminos, an SS version was offered that was completed by Choo-Choo Customs in Tennessee. It started with the sleek styling that the vehicles were designed with, and added a more aerodynamic front end for an even cleaner look. This particular one has less than 49,000 actual miles on it and lots of records showing the meticulous care this car received through the years. Check it out. The looks of this car are super crisp and clean coated in its factory correct White paint. There is no trim or ornamentation disturbing the lines or the look. Just one simple and subtle pinstripe that runs front to rear along the top edge of the fenders and doors. An eggcrate grill is flanked by quad headlights and underlined by simple and sharp looking chrome bumper. A chin spoiler reaches for the ground and wraps around to the front fender wells. Body colored side mirrors continue the look and a chrome door edge guard helps protect that area from dings. Chrome dresses out the top edge of the bed running all the way up and around the rear of the roof in the process. A Chevy bowtie appears on the tailgate just over a chrome trimmed tag bracket and another sharp looking bumper. The bed itself is Rhino lined so that it can live up to its utilitarian purposes too, so go ahead, use it like a truck! Inside this low mileage ride you will find a beautiful and comfortable Red interior. The molded door panel has a door pull at the top and a long, comfortable armrest. Splashes of chrome outline the top edge of the panel as well as on the power window and lock switches. The 70/30 split bench seat is super comfortable upholstered in pleated cloth and trimmed in vinyl with a fold down armrest in the center. A two spoke steering wheel has an El Camino horn button and is mounted on a tilt column. The stock dashboard is neat and clean with the tach on the right, speedo on the left and engine gauges between them. Ventilation controls include those for air conditioning that has been upgraded to R134 to keep you cool if you are stuck in traffic or cruising on a hot summer day, and the factory original FM/Cassette deck is still in place for your listening pleasure. A cup holder has been placed on the floor in the center and the good-looking carpeting is protected by floor mats. Under the hood of this car you will find a neat and clean 305 cubic inch V8 set down the engine bay that you can tell has been well maintained. There are newer belts and hoses as well as a fresh battery. The air conditioning compressor was replaced along with the lines and converted to R134 in the process. Underneath the black air filter assembly is a Rochester Quadra-Jet carburetor feeding a stock intake and cylinder heads. Exhaust flows out through stock manifolds but then through Flowmaster mufflers which give this exhaust a nice sound to it. Power flows back through a 3-speed automatic transmission to the rear wheels located by trailing arms with leaf springs while up front a control arm suspension with coil springs a beefy sway bar provides good handling as well as a nice ride. Power front disc brakes provide good stopping power and the rubber meets the road through 225/50R17 tires mounted on chrome American Racing alloy wheels that really look great. Come on down and check out this great looking, low mileage, well maintained Camino SS.